This was the last 100-mile week of my Mohican Trail 100-Mile Run (June 20-21) training as I now enter the tapering stage. Hopefully for me, it'll just be a one-day affair! My goal for Mohican is to set a new 100-mile PR and contend. My PR is 19:22, set at last year's race. For the week I logged 100.11 miles, including a productive 9.6-mile hill-repeat session on Wednesday. I ran four repeats in the Chagrin River valley going up toward the Chagrin Falls village. For the uphills, I tried to hold an aggressive pace of anywhere from 6:10-6:30, with the downhills at a pretty relaxed pace. Given that I only recently incorporated hill-repeats and Mohican is now just three weeks away, I don't want to run the downhills too aggressively because it's just too risky as far as injury. That said, I do hammer most downhills when I'm on the trails. I'm finding that hill-repeats are very effective at not only building strength, but also at improving leg turnover (speed) and form. They may become a fixture in my training. I also worked in a nice tempo run, a.k.a. lactate threshold run, on Friday. I held about 6:15 pace for five straight miles on a total run of 10 miles. The benefit of tempo runs is that they allow you to hold a more aggressive pace for longer a la the ever-important lactate threshold. Over the weekend, I completed long runs of 21.6 trail miles on Saturday and 16.6 road miles on Sunday--both with the Cleveland Southeast Running Club. I wish I could get to the track for some intervals, but for Mohican the best approach is a consistent diet of tempo/lactate threshold, hill-repeat and long-run training. I think overall my Mohican 100 training has gone well. When I think about where I was in March--sick and coughing up a storm but still able to finish the Lt. JC Stone 50K with a respectable 3:46 thanks to fresh legs--and where I am now, I feel good about how far I've come. That said, I'm a little tired and ready for Mohican to happen. I think the taper will be good for me. In my last training week post, I said that my goal for three weeks out (from Mohican) would be "maximum high-mileage." Having consulted some of my running friends, I've since revised that goal to a 10-15% drop from this week's mileage--so my goal for the coming week will be 85-90 quality miles. Then the real taper will be on. Recently I was told I'm obsessed with mileage. While it's true that I set mileage goals and usually stop at nothing to achieve them (even if it means circling the parking lot in Solon multiple times), saying I'm mileage-obsessed really misses the mark. Preparing for a 100-miler requires absolute focus on one's training and total confidence (in addition to plenty of sacrifice). Confidence is key. I gain confidence in my ability to finish and contend in a 100-miler through completion of 100-mile weeks. If I wanted to finish a 100-miler without any concern for placement, 100-mile weeks wouldn't be so necessary and instead I might run 60-80 miles each week. Bottom line: If you want to reach your potential as a runner, you have to not only train intelligently (as I'm still learning to do through trial and error), but also PUT IN THE MILES. As you may have noticed, I recently added a poll to this site, asking who will win this year's Western States 100. The field is strong and includes seven-time WS100 champion and ultrarunning legend Scott Jurek. Jurek will have his hands full as Anton Krupicka, Hal Koerner, Jeorge Pacheco, Eric Grossman, Michael Wardian and other elites will surely be in the hunt. My money is on Jurek. 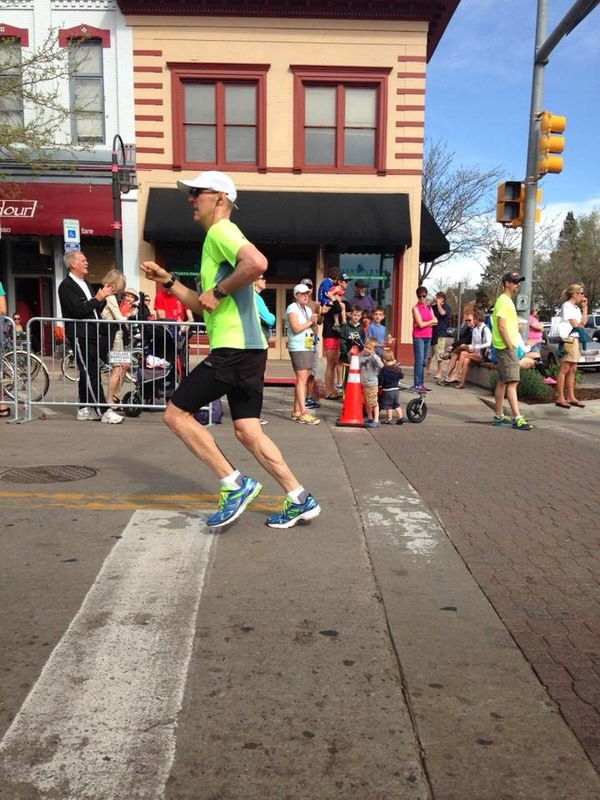 In a 100-mile race, he's unstoppable, and he knows that course like the back of his hand. I really hope I will be among those toeing the line at next year's Western States 100. Here I am preparing for the Mohican 100, a race with 23,000 feet of climb and descent. The WS100 has more than 40,000 feet of gain and loss, along with mountains, ridges, canyons and suffocating heat. When the days comes that I run in the WS100, it will be an unmatched challenge. How else to say it? The Cleveland Marathon (May 17), while not a key event for me, didn't leave a whole lot of strength and energy in my legs. On the heels of my 2:59 at Cleveland, I took Monday--the day after the race--off to rest and recover, and then was mostly back in action on Tuesday. For a few days I battled that awful feeling of stiff, achy and somewhat weak legs, also known as "trashed legs." The worst of the problem was in my quads. The after-effects of a race are always ever-present in my quads. After my first Boston Marathon in 2006, I could barely walk for a few days. That is the God's-honest truth. Despite trashed legs, I managed 77.4 miles, including a tough hill-repeat workout on Thursday and a pretty high-mileage three-day weekend. The weekend saw 18 uncomfortable miles on the trails of South Chagrin Reservation on Saturday, 19 road miles on Sunday that included a relaxed showing at the 5.25-mile Blossom Time Run as part of the annual Blossom Time Festival in beautiful Chagrin Falls (more on that below), and 13.1 road and trail miles on Memorial Day (which "count" for next week, not this week). When we went to sleep on Saturday night, my plan for Sunday's run was to get in 20 solo miles on the roads around where we live (I elected to skip the Solon run because I figured most everyone from the running club would be at the Blossom Time race). Still feeling trashy in the legs, I wanted to avoid the Blossom Time Run because I felt that if I couldn't race it there was no use showing up. I am, after all, pretty competitive. But then when I woke up on Sunday I realized that if I can't participate in a race for the sake of fun and supporting a good cause, have I not lost the joy of running? You can't race every race! So I ran to registration and signed up, logging 10 pre-race miles, ran my 33:31 and then ran home for a total of 19 miles. My 33:31 at the Blossom Time Run, which got me third in my age group, was a full 2 minutes slower than last year's time. But this time last year I hadn't logged two 50Ks and a marathon, as I have this spring. Later on Sunday night we walked down to the Blossom Time Festival, where we joined with a group of friends from the Southeast Running Club to watch Chagrin Falls' very own Carley Tanchon sing at Triangle Park. A very talented artist, Carley sang many songs from her most-excellent new album, "Peridot." Afterward, Carley's folks had Anne, Noah and me and a bunch of others over to their place for a cook-out. Tons of fun! A few words on hill repeats. While I run hills all the time (Chagrin Falls has many hills), hill repeats are new to my training and I'm still trying to figure them out. I'm quite sure they're very beneficial to 100-mile trail training, and I've been told they improve form. I run my hill repeats on Chagrin Boulevard, which is a long stretch going from the Chagrin River valley up to the Chagrin Falls village. Currently, the boulevard is closed for construction, making it a perfect place for hill repeats as I don't have to worry about traffic. I lightly run down the hill, and then go hard up it--usually at a 6:30/mile pace. The stretch is about 1/3 mile long--I need to measure it to be sure. But in the end I know I've done something right because my legs, while tired, are turning over fast. Ideally, I want to be ready to negotiate the hills at Mohican late in the race. Race Week: one day of running; the rest are walking and/or off days with no workout over 35 minutes. Special dieting to ensure optimal protein and carbohydrate intake. I've also begun gathering race supplies and thinking through the specifics--what I'll need and when I'll need it. I am very fortunate to have an outstanding crew at Mohican. 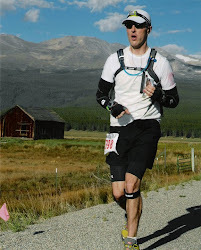 Joining me will be Kenny M., an aspiring 50-states marathoner who has paced me at both of my 100s and is as supportive, reliable and trustworthy as they come, and Dan C., an ultrarunner who comes highly recommended by Kenny. I am grateful that Kenny and Dan will be at Mohican supporting and looking out for me. Right now I'm reading a new book called Born to Run: A Hidden Tribe, Superathletes, and the Greatest Race the World Has Ever Seen, by journalist Christopher McDougall. I will write a full review of the book when I'm done with it but I have to say that so far this is a great read. McDougall highlights the extraordinary world of the Tarahumara Indians of Mexico’s Copper Canyons. The Tarahumara are legendary long-distance runners living in a very dangerous part of the world. Stay tuned for a review. I also finally ordered the DVD "Yiannis Kouros: Forever Running" from Zombie Runner and watched it over the weekend. This 60-minute documentary with English subtitles focuses on the life of the great Kouros, who owns more than 150 ultrarunning world records. Yiannis is a very serious, thoughtful man and one can learn so much from listening to and watching him. One day I'd like to meet him. I love listening to him talk about his out-of-body experiences during his events. And I agree with him that one doesn't become an ultrarunner until he or she has gone so far that their body fails on them and all they have left to keep going is their mind. Watch this video and you'll get to know Yiannis Kouros and learn more about the sport of ultrarunning. With the Cleveland Marathon now behind me, the Mohican Trail 100-Mile Run looms. It is hard to believe that Mohican is just four weeks away (June 20). This will be my second consecutive Mohican and third 100-miler. For me, no race commands more dedication, focus and energy than a 100-miler. Describing what it’s like running 100 miles is really difficult for me, maybe because I’ve only run in two 100s and I’m still trying to figure them out (as if that’ll ever happen!). During the event, you experience a range of positive and negative feelings—the lowest of lows (“I’m not gonna make it”) to the highest of highs (the feeling of being unstoppable). Gabriel Flores, former winner of the Badwater Ultramarathon, once said that during Badwater he could be dying one second and flying the next. His observation certainly applies to 100s, and it speaks to the need to take the good with the bad and kind of roll with the punches. That’s not only the way of 100s; it’s the way of life. A lot of people are inspired to try ultras because there’s something about them that captures the imagination and stokes primal instincts deep within the soul. One must know that an ultra will bring physical and mental suffering, and many recognize that out of suffering comes wisdom and strength, which we all seek. I say suffering with some hesitation because, to me, true suffering is inescapable and something you have no choice but to endure. Whereas you can escape a 100 by dropping. But to the extent that you can immerse yourself in the ultra experience and develop the mindset that you are here and there is no way out except through the finish line, yes, you suffer, and the suffering does bring a certain degree of enlightenment. It is truly a transformative experience that takes time to understand and appreciate. This is seen in the 100-mile finisher who says "never again" and yet returns the next year. But are greater wisdom and strength worth the suffering a 100 brings? Ask that of any 100-mile runner and they’ll say yes. And they’ll probably also say that a 100 is who they are. You’re out there, often alone, trudging through nature and managing pain and discomfort with essentially one goal – moving forward. The foods and liquids you consume at the aid stations aren’t for enjoyment; they’re to keep you moving forward. The volunteers you meet at the aid stations are inspiration to keep you moving forward. Every step is one step closer to the ultimate goal. Your whole mindset is geared toward forward progress and, for the many hours you’re immersed in the ultra experience, you’re freed from the every day concerns of life – paying bills, performing at work, worrying about your kids, cleaning up messes. During his races, Kouros says that there is a separation of mind from body, even though the mind still gives commands to the body. "The pain is the reality but your mind can inspire you past it. I look to the countryside, music, and art, to help inspire me." He says that his body speaks to him, "stop," "give me something to eat," or, even, "take me to the hospital!" Adds Kouros, "we have ups and downs in life and the same is true in ultramarathons. I need those ups and downs to go back to my childhood, memories, and past experiences." 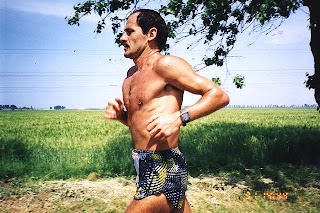 It is from those, especially the painful times, that Kouros draws some of his inspiration and, because we gain more and more life impressions as we age, "the older you are, the better for ultrarunning because mental experience is much more important than physical speed." The difficulties are what help Kouros find his "strength, passion, and inspiration." He draws from Greek literary references in explaining that it is the contrast of the mental, artistic, and spiritual qualities of Apollo to the corporeal elements of Dionysus that he tries to balance. As a guy who wears a suit and tie to work every day and lives in the suburbs, the mental and physical violence of a 100 has great appeal to me, because it reminds me of the fact that my identity isn’t tied to what I own, where I live, or what I do for a living; it’s tied to what’s within my heart and soul. There I find my family and my faith, my two greatest sources of strength in 100s, and most certainly in life. This year’s 32nd Rite-Aid Cleveland Marathon was a tough race. The organizers rolled out a new course that was supposedly going to bring more tail wind. Anyone who’s run the Cleveland Marathon over the past few years knows that this race is notorious for its fierce wind coming off of Lake Erie. Despite the new course, the wind was definitely a factor at this year's race, delivering seemingly non-stop gusts of 20-30 miles per hour. As a relatively tall runner (6’2”, 168 lbs. ), the wind was pretty hard on me. I battled through the 26.2 miles, never quite getting into a groove, but still managed to finish 34th overall with a respectable time of 2:59:01 (6:49 pace). This marked my third consecutive sub-3-hour marathon, but it was not a marathon PR. Before I go any further, I want to congratulate the Cleveland Southeast Running Club president and my friend, Frank D., who at 52 years-old broke 3 hours for the first time with a 2:56 at Cleveland. On the heels of a 3:00:13 at the Boston Marathon only a month ago, Frank ran a very strong, determined race at Cleveland and all of us in SERC are happy for him. 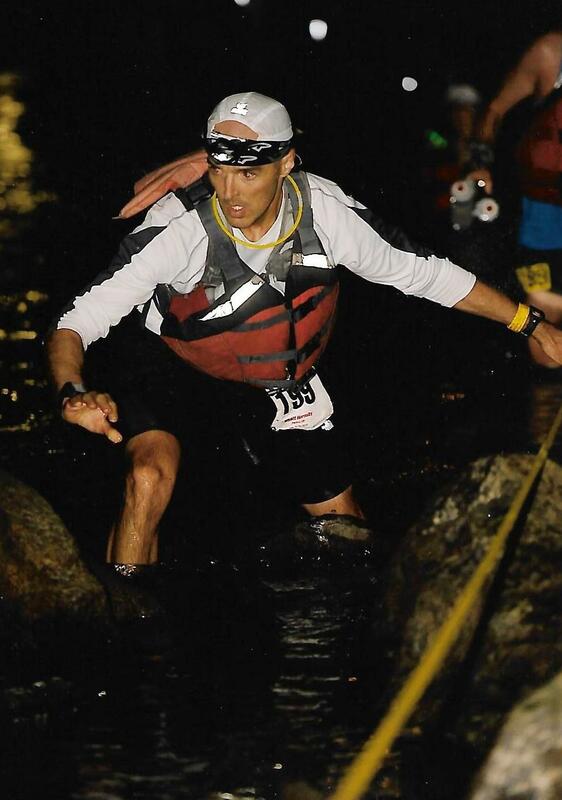 He’ll be running in the Burning River 100 on August 2 and will surely do well. The Cleveland Marathon was begun in 1978 to promote health and fitness in Cleveland. The race also raises money for Cleveland Marathon Charities, a 501(c)(3). which has donated more than $1 million to local charities since its inception in 1977. CMC donated over $60,000 in 2007 and 2008 alone to various non-profits involved in health and wellness. You can see where these donations go by clicking here. 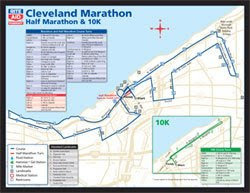 The Cleveland Marathon is kind of a figure-8 course run through a number of urban areas in and around the city. It starts at East 9th Street and St. Clair Avenue and goes west along Erieside (around the north side of Cleveland Browns Stadium), south along West 3rd and West 6th streets with a stretch on Prospect/Ontario, and then west on Lorain/Carnegie, Detroit Avenue and Lake Avenue. Then you wind around and follow Edgewater Drive (passing Edgewater Park, where the NorthCoast24 will be held on Oct. 3-4, 2009) to the Shoreway and North Marginal. You then head up East Boulevard and then back down the beautiful Martin Luther King Boulevard in University Circle, turning west onto St. Clair Avenue, with a stretch on Euclid Avenue, and eventually crossing the finish line on Lakeside downtown. The good: Save the ferocious wind, the sun was out and it was beautiful with the temperature going from the high 40s to low 50s--perfect. I liked the course. It offered a nice view of Cleveland with a long stretch along the scenic Lake Erie. The races were also pretty full, with the half-marathon actually selling out. Only a few years ago I could drive up and park about 100 feet from the start. Not this year. This is, of course, a good sign because it shows growth. As far as my time, while it was 4 minutes off my goal, I broke 3 hours and anytime you break 3 you’re doing something right. The race was also well-organized with ample volunteers, security and traffic-control personnel, plenty of water drops and two strategically located gel stations. Also, and as always for the Cleveland Marathon, the finisher’s medal and tee-shirt were high-quality. Finally, I saw the legendary Bill Rodgers at the expo. That was pretty cool. The bad: The wind was pretty awful. It seemed like everywhere I turned wind was in my face. The stretch along the Shoreway Bridge, where I felt like I was in a wind chamber, was horrendous. This was no one’s fault, of course. Another bad was my inability to get into a groove. Some days you have it; some days you don’t. I’m just glad I had enough to cross in under 3 hours. No worries--the time to peak isn't now; it's at the approaching Mohican Trail 100-Mile Run. The ugly: The crowd support was pretty much null and void and embarrassing to this Cleveland-area resident who wants so badly for our city and region to move past our reputation as a joke. Next to the 2007 Erie Marathon at Presque Isle, this year’s Cleveland was the loneliest marathon I’ve ever run. Maybe there was a memo to the city’s residents telling them not to come out and join in the festivities. Also, the speakers blaring rock music every mile or so, with no one around, was a missed opportunity. As we live in the home of the Rock and Roll Hall of Fame and Museum, it shouldn’t be hard to line up some tribute bands and a party every mile to really make the Cleveland Marathon an event no one will want to miss. Have an Elvis impersonator and some bands playing the rock music you want to hear in the city of Rock ‘n Roll—songs by Alice Cooper, the Beetles, Aerosmith, Ted Nugent, AC/DC, etc. During the last 6 miles I had serious doubts about being able to finish in under 3 hours. As I ran the hill up to East Boulevard at mile 17, I felt some burn in my legs and, for a second there, wondered if I was about to run out of gas. But I recovered and stayed on pace. The stretch down MLK (mostly mile 20) is always tough for me for whatever reason. I managed to regroup mentally on St. Clair Avenue, but then when I got onto the 40th Street/Euclid Avenue/East 18th Street stretch, things got ugly as the wind was blowing me in all directions and some idiot motorist pulled out in front of me and (fortunately) got tagged by the police officer directing traffic. The wind on East 18th was particularly bad and it was only through experience and resolve that I held it together. Needless to say, I was quite happy when I crossed the finish line—no more wind to fight. I can run 7:30 pace for a long, long way, but when I’m pressing for 6:40 pace I have to have put in the necessary tempo running during training to maintain such a pace. If I’m ever to go south of 2:55 in a marathon and hopefully break 2:50 one of these days, I have to emphasize lactate-threshold workouts (a.k.a., tempo runs) just as much as high mileage (long runs and two-a-days) and VO2 max (intervals) workouts. Plus, the one-week taper may not have been enough. All of that said, the Cleveland Marathon, while important to me, was not a key event on my calendar, so I’ll take my 2:59. For the week, I ran 58.5 miles, including the Cleveland Marathon, and will look to recover in the coming week with a goal of 60-65 relaxed miles. If I’m feeling really good by Memorial Day weekend (my favorite weekend of the year), I may adjust my goal upward just a little. Then next week I begin a two-week high-mileage cycle to wrap up my Mohican Trail 100-Mile Run training and go into a two-week taper for the big event. My goals for those two high-mileage weeks are 90+ and 100+ miles, respectively, but no goal is more important than STAYING HEALTHY. That means continued emphasis on stretching, ice baths, good dieting, etc. Runners are always looking for a great recovery food and I think I’ve found one. If you’re a runner who loves oatmeal, the following recipe may be right up your alley after a hard morning workout. My Power-Packed Recovery Oatmeal brings a nice punch of carbohydrate, protein, fiber, calcium and potassium, and it tastes great. Give it a shot. Disclaimer: The consistency of one's oatmeal is entirely personal. Some like their oatmeal thick; some like it thinner. I go for the thicker consistency. If you like yours thinner, you'll want to add a little more water or milk, but be sure to add your water or milk gradually so to avoid making your oatmeal soupy. Bring the water to a full boil. Pour in the oats, peanut butter and brown sugar. Reduce heat to medium-low and stir the oat mix. Be sure to keep stirring for about 5 minutes as the oats and peanut butter can easily burn (stir for just one minute if you use Quaker Quick Oats). Add water as needed to keep the oatmeal at the desired consistency. Add the milk and banana just before serving. If the oatmeal is too thick, add a little more water or milk. I also recommend adding some maple syrup for a little extra sweetness. Enjoy! It is hard to believe that Noah is now one year-old. This time last year we were still in the hospital and getting ready to go home. Now a year later, he’s close to walking on his own and is happy as could be. Needless to say, he makes Anne and me very proud and brings us great joy. When I wrote my previous post, I was pretty certain that a case of hamstring tendonitis would force me to skip the Cleveland Marathon. My concern was that a hard effort at Cleveland would be detrimental as I prepare for the Mohican Trail 100-Mile Run--my key event for the summer. Never could I have imagined then that my hamstring tendon would begin to feel much better and carry me to a 91.6-mile week. So, as of now, I’d say the Cleveland Marathon is looking up--we'll say "probable." Unlike the 2008 Cleveland Marathon, where I was determined to finally break 3 hours for the first time, I enter this year’s race looking for another sub-3 but ready to adjust my pacing as needed. In other words, if my hamstring starts to hurt, I’ll slow down and go into the finish conservatively. The problem with my hamstring tendon isn’t one of pain. It’s one of tightness and discomfort. Runners know the difference between discomfort and pain. But over the course of 26.2 miles, discomfort can easily turn into pain. Last year's Cleveland Marathon was probably my most memorable marathon. After we (Jeff U., Paul R. and I) turned onto the Lake Erie path from MLK Boulevard with about 6 miles to go, I was hurting badly and began to fall back and off pace. At the time we were running with the 3-hour pace group and I’d begun to doubt that I’d make sub-3. The pace leader dropped back a little and put his hand on my back, saying (in these words that I’ve never forgotten): “Hey man, I’m worried about you getting too off pace. Do you think you can pick it up?” Hurting badly, I watched with great distress as Jeff, Paul and the pace group got further and further ahead of me. But then a funny thing happened. I got a second wind and caught up with Jeff. I was still hurting, but I managed to get back on pace and stay at a good clip en route to a new personal best of 2:58 (Jeff finished with a 2:57). 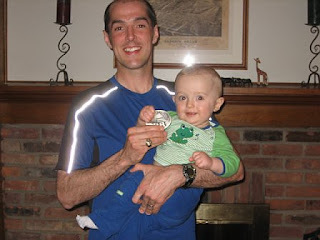 I learned a valuable lesson that day—a lesson I carried over to the Columbus Marathon in 2008. Running a successful marathon comes down to how you manage that final 10K. Despite my hamstring injury problem, I managed 91.6 miles this week. On Tuesday I went to the track and did 4x1600 at 5:56 pace and experienced a wicked case of dead legs from the previous week’s 108 miles. By the fourth interval my feet were crashing against the track like cinder blocks. Later that night, during a 4-mile treadmill run, I realized something was really wrong with my hamstring tendon. It was super tight and very uncomfortable. The rest of the week I ran daily (at a semi-relaxed pace) and incorporated nightly ice baths, extra stretching and some ibuprofen. The ice baths worked because my hamstring was considerably better by Friday—so much better that I was able to get in back-to-back 20-mile days on Saturday (trails) and Sunday (Solon Roads) with the Southeast Running Club. I did these 20s with Mohican, not Cleveland, in my sights. Not until Sunday was the Cleveland Marathon back on my mind as a real possibility. 1) Get a clock so you can keep track of your time in the tub. 2) Get in the tub with it empty. 3) Have reading material on hand to pass the time (for me, it's usually a running magazine, my Don Allison ultrarunning book or my baseball almanac). 4) Turn on the water full blast cold and let the tub fill up. 5) Lean back and keep your legs completely submerged in the cold water. 6) If you are really bold, add the contents of your ice box to the tub to maximize the coldness. 7) Know that while the first 3 minutes are painful, you will eventually get used to the coldness and it won't even bother you. 8) Soak for 15-20 minutes. 9) Enjoy a warm shower afterward. Ideally, you want to ice bath right after a run, but because of time constraints in the morning I've been ice bathing at night before bed. Give it a shot. The goal this week is to taper for the Cleveland Marathon, keep ice bathing and run low mileage. I hope to break 3 hours at Cleveland but we’ll see how the leg is feeling. So far, so good. Assuming I run Cleveland, I'll enjoy a post-race recovery week and then will try to get in two consecutive high-mileage (90-110 miles) weeks before going into a two-week taper for the Mohican 100. After reading up on hamstring tendonitis, it's now obvious that this is what I had last fall going into the Columbus Marathon. One morning last September, I was running hard on the track and suddenly felt pain in what I thought was my IT band. Within a few seconds I felt extreme pain in my hamstring and hobbled home, figuring it was a strain. The injury, which kept flaring up every time I ran fast, ultimately "slowed" me down to a 2:59 at Columbus--5 minutes off my goal. And it cleared up by the new year...or so I thought. What I now know is that the root problem of my hamstring injury was tendonitis, which can often lead to a strained hamstring (hence what happened on the track that September morning). So it's now clear that hamstring tendonitis is an issue with me that I have to constantly watch over and proactively manage. Fortunately, my hamstring muscle is so far OK, and the tendon itself is uncomfortable but not painful (yet). With an eye toward the upcoming Mohican Trail 100-Mile Run (June 20-21), I've suspended fast running for now and, regrettably, will likely have to skip the Cleveland Marathon. I'm taking daily ice baths to manage the inflammation, stretching multiple times a day and avoiding steep hills. I can still run well and this week should hit about 80 miles. But running fast and aggressively is a huge no-no because it will inflame the tendon and thus my risk of a strained hamstring muscle rises greatly. So for now the plan is no fast running, no Cleveland Marathon and continued extra effort with stretching and ice baths. I have to protect my hamstrings because there is no way I could complete the Mohican 100 the way I want without both of them functioning at 100 percent as I negotiate the course's 23,000 feet of total climb and descent. I'm really not that worried because I have six week until Mohican to get well, I'm still running good mileage and I'm already seeing some improvement with the tendon thanks to the ice baths. I'm just really disappointed that the Cleveland Marathon is not going to work out. Looking at the big picture, I need to rethink my approach to running. I will always be a high-mileage runner (at least for a few more years), but perhaps there are some things I could do to help avoid injuries like this one--things like yoga (just ordered a video), extra stretching (doing that now), strength training (not doing but am figuring out ways to incorporate) and cross training (not really doing). I have reached out to a well-known ultrarunner who lives his life and runs in a way that I really admire and hopefully he can help provide me with some ideas on new approaches. We'll see what he says and I'll share his name if he agrees to help me as my coach. I will continue to leave updates on here. Please let me know if you have any experience with hamstring tendonitis and what worked for you. Humility. There’s not enough of it in the world. Entering last year’s Mohican Trail 100-Mile Run, I knew I was in the best shape of my life. Despite a lack of sleep as we took care of then-6-week-old Noah and a beaten-up body after PR’ing at the Cleveland Marathon and hammering the Blossom Time run a week later, I kept plowing through 100-mile weeks with crazy thoughts of doing something special at Mohican. On the morning of June 19, when the gun went off down at Mohican, I exploded out of the "gate" and ran hard. Really hard. Bob P., with the best of intentions, tried to reel me in. I slowed down a little, but I was still going hard. And then my left knee exploded at mile 60, when I was leading the race, and was obliterated by mile 80. While I hobbled along on my bad knee, two guys passed me who looked fresh as daisies. One of them was the eventual winner, whose marathon PR was/is 20 minutes faster than mine. By mile 90 I was suffering from severe diarrhea and could barely walk because my left knee was so painful. Another guy passed me with three miles to go. When you’re flying high and think you’re indestructible, nature has a funny way of pulling you back down in the most painful of ways. It’s one of life’s many blessings in disguise. You need a correction now and then; otherwise you stay on the wrong path. With that said, in my mind it doesn’t matter how good I’m feeling or what I may think I can do. This time last year I was soring only to crash hard into the ground. I know how quickly things can turn bad. And so as I train hard for the Mohican 100 I know how fortunate I am to be running at what is a good level for me. All I’ll do is keep running and hoping for continued good health, especially during the 100. I finish when I finish, and my place is what it is. Feeling as good as I do right now, it’s easy for me now to get sucked into going for a PR at the Cleveland Marathon. If a PR happens, that’s great. But I can’t get sidetracked or ignore the fact that marathons beat me up. All along the Mohican Trail 100 has been my focus, and it will continue to be my focus. Right now in the Southeast Running Club there are a lot guys talking it up about who’s going to run what at Cleveland. I said I might go for a 2:55 or better. No! Stay focused on Mohican and let what happens at Cleveland happen. There’s a time for marathon PRs and this isn’t the time for me. Last week I donated more than three-dozen pairs of running shoes to Easter Seals. They’d been piling up in the basement for a few years and needed to be put to good use. Getting rid of my running shoes was difficult and the fact that I finally did it surprised Anne. Shoes carry you to memories. But I didn’t need them anymore and was sure that plenty of folks living through tough times could use a pair of shoes—folks like the people who my dad occasionally visits under Atlanta highway bridges as part of his missionary work. So I boxed up my shoes and Easter Seals took them. I kept just two pairs—the shoes my mom bought me for my first marathon (2004 Columbus, 3:22), and the shoes I wore at my first 100-miler (2007 Burning River, 21:08). I will also keep the lightweight trainers I wore when I finally broke 3 hours at the Cleveland Marathon last year, but they aren’t ready for retirement yet. Of all the shoes I own, my first-marathon and first-100 shoes mean more to me than any others. If you have dozens of pairs of shoes that are just lying around, please consider donating them. I know Easter Seals would be happy to pick them up. All you have to do is call Easter Seals to let them know of your donation, box up your shoes, write in "Easter Seals" on the box and place the box outside for them to pick up. This was probably the best week of training I’ve ever had. I set a new weekly record, with 108 miles, including good interval, hill and tempo workouts. I started the week feeling fresh as a daisy and ended the week feeling very strong, despite the mileage and 12 yards of mulch that I moved from Friday to Sunday. On Saturday down at South Chagrin Reservation I hammered the hills. There’s a 6-minute loop that I kept running back and forth. These aren’t huge hills but they’re good for repeats and they get the legs ready for a hilly 100. When and if the day comes that I’m accepted into the Western States 100, I’m going to have to find even bigger hills to try to get my legs in shape for the mountains and canyons of the Sierra Nevada region. The 108-mile week included a Tuesday interval workout consisting of 3x1600 at 5:38, 5:36 and 5:42, and a Thursday tempo run in which I held about a 6:20 pace over 6 miles (9.35 miles total). On Friday I ran a 20-miler on the trails, on Saturday 16.1 miles with hill repeats on the trails, and on Sunday a hard 16.5 miles in Solon with the Southeast Running Club. All other runs were at easy or normal pace.